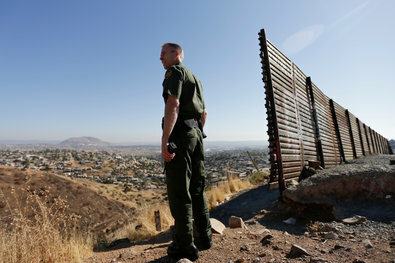 NYT caption: "At the U.S.-Mexico border, which nation is a “land of opportunity?" Ambitious immigrants from around the world are flocking to Mexico, where a rapidly growing economy is seen as creating opportunities for those who work hard to do well. People used to say that about the United States. Can a developed economy like the U.S. provide similar opportunities for people to move up the economic ladder, or is rapid growth essential to upward mobility? This a meme that the prestige press has been promoting to bolster Schumer-Rubio propaganda: Handing out the Path to Citizenship now won't lure in future Undocumented Workers, because America doesn't have to worry about illegal immigration ever again! Alternative interpretations would include: "Wow, look at that picture: What a crap border fence compared to the fences that a serious country like Israel has. There's no barb wire and then it just ends ..." Or, "So, everything's peachy in Mexico, so illegal aliens are unlikely to starve if they have to go home." But those interpretations won't come up because all that counts is winning and the easiest way to win is to hold the Megaphone. But, in reality, is Mexico's economy "rapidly growing" and are immigrants "flocking to Mexico"? The Mexican government's original GDP growth forecast for 2013 might have been a little too enthusiastic. The 3.1 percent increase forecast for this year fell to 1.8 percent recently after the Instituto Nacional de Estadística y Geografía (National Institute of Statistics and Geography, or Inegi) calculated that the economy's growth for the second quarter was just 1 percent. The news corresponds with a report by Moody’s that points to Mexico's growth as its "unfinished homework." Mauro Leos, Moody’s Mexico director, said that from 2003 to 2012, the average annual growth rate for Mexico, the second-largest economy in Latin America after Brazil, was 2.5 percent, much lower than the average Latin American growth rate during the same period. Nevertheless, in the last three years, the rate of growth had climbed up to 4.4 percent. Despite that, “things always go back to normal,” he said. 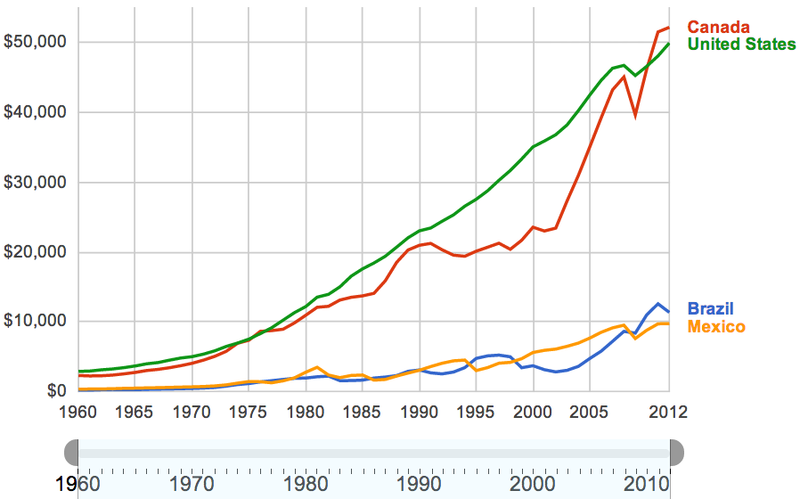 Ways to measure GDP per capita are complicated, so I won't proclaim this graph provided by Google from World Bank data as the ultimate way to measure changes in GDP per capita, but it's worth looking at, if only to save: Wow, look at Canada! MEXICO CITY — Mexico, whose economic woes have pushed millions of people north, is increasingly becoming an immigrant destination. The country’s documented foreign-born population nearly doubled between 2000 and 2010, and officials now say the pace is accelerating as broad changes in the global economy create new dynamics of migration. The accompanying graphs, however, show just how few immigrants there are in Mexico (or at least have been counted). There are a total of 961,121 foreign-born people living in Mexico. Wow, that's almost a million! But, here's a question: What's the total population of Mexico? The latest estimate is 116,000,000. So that's under 1.0%. In contrast, the foreign born population of the United States is over 40,000,000, versus about 270,000,000 natives, or about 15% of the native population. And Mexico gives out a grand total of 301,795 work visas, out of working age population around 70 million. In the long run, Mexico should have more foreigners, especially American retirees, residing there. It attracted lots of immigrants in the past, such as the ancestors of Carlos Slim, Vicente Fox, Salma Hayek, Frida Kahlo, Anthony Quinn, and so forth. Former foreign secretary Jorge Castaneda outlined in 2011 a number of reforms to make Mexico better both for American retirees and for Mexicans, such as more traffic lights. Most importantly, he felt, was for Mexicans to stop referring to Americans using ethnic slurs. The latest government of Mexico has suggested a number of hopeful-sounding reforms devoted to cracking down on monopoly power in Mexico (Carlos Slim, Pemex, and the teachers' union that has turned many teaching jobs into hereditary sinecures). These are problems not impossible to overcome, and I wish Mexicans well in fixing their country.